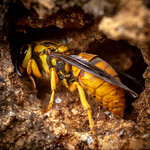 I am a photographer and research scientist specializing in insects, especially ants, but also beetles, bees, wasps, and various other arthropods. My scientific background is in systematics, a broad field that includes the discovery, description, and classification of life and the inference of evolutionary relationships. I am currently Curator of Entomology at the University of Texas at Austin, where I manage a research collection of around 2 million preserved insect specimens. The word Myrmecos derives from ancient Greek for “ant” and reflects my fascination with the earth’s most abundant social organisms. Myrmecos blog, online since 2007, is an exploration of these and other small animals. Want a full hour of Alex? Listen to the definitive Age of Discovery interview. Ants have long been a passion of mine, and I am occupied with several projects related to ant taxonomy, evolution, and systematics. My evolutionary research focuses on closely-related groups of ant species, as I use patterns of recent speciation to infer how evolutionary processes may function across diverse landscapes and ecological contexts. I have worked extensively on the neotropical genus Linepithema, a group best known for the pestiferous Argentine ant L. humile, and have produced a molecular phylogeny and a taxonomic revision of the roughly 20 species. Ongoing phylogenetic research includes studies in the genera Pheidole, Azteca, and Simopelta. My taxonomic work addresses some of the many remaining gaps in neotropical ant systematics, tending to focus on groups that are commonly encountered but lack modern taxonomic resources. I have also focused on describing the ant fauna of Paraguay, a landlocked country that sits at a fascinating transition zone among surrounding tropical, temperate, xeric, and mesic biomes. Porter, S. D., Valles, S. M., Wild, A. L., Dieckmann, R., Plowes, N. J. R., 2015. Solenopsis invicta virus 3: Further host-specificity tests with native Solenopsis ants (Hymenoptera: Formicidae). Florida Entomologist 98: 122-125. Spitzer, B. W., Wild, A. L. 2015. Effects of tree mortality caused by a bark beetle outbreak on the ant community in the San Bernardino National Forest. Ecological Entomology 38: 439-447. Wild, A. L. 2007. A Catalogue of the Ants of Paraguay (Hymenoptera: Formicidae). Zootaxa 1622: 1–55. Wild, A. L. 2007. Taxonomic revision of the ant genus Linepithema (Hymenoptera: Formicidae). University of California Publications in Entomology 126. Wild, A. L., and F. Cuezzo. 2006. Rediscovery of a fossil dolichoderine ant lineage (Hymenoptera: Formicidae: Dolichoderinae) and a description of a new genus from South America. Zootaxa 1142: 57-68. Wild, A. L. 2005. Taxonomic revision of the Pachycondyla apicalis species complex (Hymenoptera: Formicidae). Zootaxa 834: 1–25. Coleoptera is the most diverse of the insect orders, yet the reasons behind their tremendous diversity are still poorly understood, in part because a strong phylogenetic foundation for the group has been lacking. I have been collaborating with an NSF-funded “Assembling the Beetle Tree of Life” project with researchers at the University of Arizona, Brigham Young University, CSIRO, Harvard University, and elsewhere to resolve some of the larger phylogenetic issues in the major beetle lineages. My role in the beetle projects has primarily been to develop new sources of molecular data from the nuclear genome, as previous efforts using mitochondrial genes and ribosomal genes have encountered difficulty resolving the ancient divergences at the base of the beetle tree. To that end, I developed protocols for several protein-coding nuclear genes previously unused in beetle systematics. McKenna, D. D., Wild, A. L., Kanda, K., et al. 2015. The beetle tree of life reveals that Coleoptera survived end‐Permian mass extinction to diversify during the Cretaceous terrestrial revolution. Systematic Entomology, online early. Short, A. E. Z., Joly, L. J., Garcia, M., Wild, A. L., Maddison, D. R. 2015. Molecular phylogeny of the Hydroscaphidae (Coleoptera: Myxophaga) with description of a remarkable new lineage from the Guiana Shield. Systematic Entomology 40: 214-229. Wild, A. L., and D. R. Maddison. 2008. Evaluating nuclear protein-coding genes for phylogenetic utility in the Coleoptera. Molecular Phylogenetics and Evolution 48: 877–91. The hyperdiverse genus Heterospilus (Braconidae: Doryctinae) is among the most common wasp genera in neotropical forests. 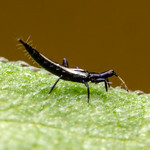 These small parasitic insects inhabit a broad range of habitats and generally attack stem-boring beetle larvae, but little is known about the biology of most species. Costa Rica contains approximately 300 Heterospilus. Because these wasps are abundant in insect samples from the region, the lack of knowledge about the number, nature, and identify of species formed a significant taxonomic impediment. Working with braconid experts Paul Marsh and Jim Whitfield, we produced a monograph of the Costa Rican species, a molecular phylogeny, a study of character evolution, and an interactive key to species. Ongoing research extends the project’s scope to other regions. You should link your interview here! You know, I was just thinking that. Piggybacking to let fellow Myrmecos enthusiasts that my website is back online. Alex please email me re a thought on publication. I work for National Taiwan Science Education Center. The aim of this center is to provide a place to learn science for students outside the school. We are now organizing an exhibition on insects in November. We would like to know if it is possible to show your photo in our exhibition. The photo we are interested is the Rock Crawler (Grylloblattaria) Carpenter Ridge, California, USA . Thank you. your email addresses…tried several are rejected by outlook. I repalced the ät”with @ but still no go. Makes it hard to contact you! I just wanted to say thank you for the educational access to your incredible images. I am preparing a presentation for my undergraduate dissertation on parasitism of social insects and in my internet-travels I stumbled across your website. Would appreciate knowing which institutions you have worked for and who is funding your research now. Also, academic back round is a factor when I attempt to establish cred. of any article I am reading. Can you provide these here? Thanks for your questions, Adrienne. In the past 10 years I have worked for the University of California (PhD), the University of Arizona (postdoc), Oregon State University (postdoc), the University of Illinois (postdoc), and since 2011 I’ve been self-employed as a nature photographer. My research funding has been provided mostly through the National Science Foundation, for studies of ant taxonomy, beetle evolution, and wasp evolution. This blog is funded through a combination of personal funds, through reader donations, and by my photography business, which subsists mostly on licenses to textbooks and magazines, but also through photography workshops. I have not actively done research since 2011, and have not received funding since then- although I am about to receive a small amount of National Science Foundation money to handle the outreach component of a fire ant population genetics project. I am glad to have found your blog, and I have found it using wikipedia on the page dedicated to ants. I like what you write, especially the pictures on your blog of good quality. I too am like blog about insects, only about termites. I saw about 20 ants riding around on our weather gauge on the deck today. They were true red on the body and black legs. I’ve never seen them before. Are they truly ants? I am interested in photographing aquatic bugs when they are emerging from the surface, donning SCUBA gear is one option, but I,’d rather watch from a different environment while photographing. Since I am doing this in the field I am wondering if there is any type of portable device that is already commercially available. Alex please check your emails.